The old wooden stair in our feng shui school and architectural office under renovation has to be replaced. It is a left hand double winder located in an area with the star combination 6m9w1p (see Flying Star chart below). This combination shows good Gua Qi support for wealth because 9 Purple Fire is a Sheng Qi star in Period 8, so it can control the 6 White Metal out of time and is also being generated-in by the 4 Green Wood Period Star and the two (9 and 4) made a LH Metal Hetu combination representing wealth as well. The movement of tenants moving up and down the stairs means we will have a steady income and that is interpreted as the Water Star for wealth is being supported by the form. However, it is not so good from a health point of view since the 6 White Metal Mountain Star is being “imprisoned” by the 9 Purple Fire, even though the chart has a “Yin Yang adding up to 10” of the Mountain Stars with the Period Stars – a fortunate structure for health, we were still worried how we can improve our wealth without losing health? 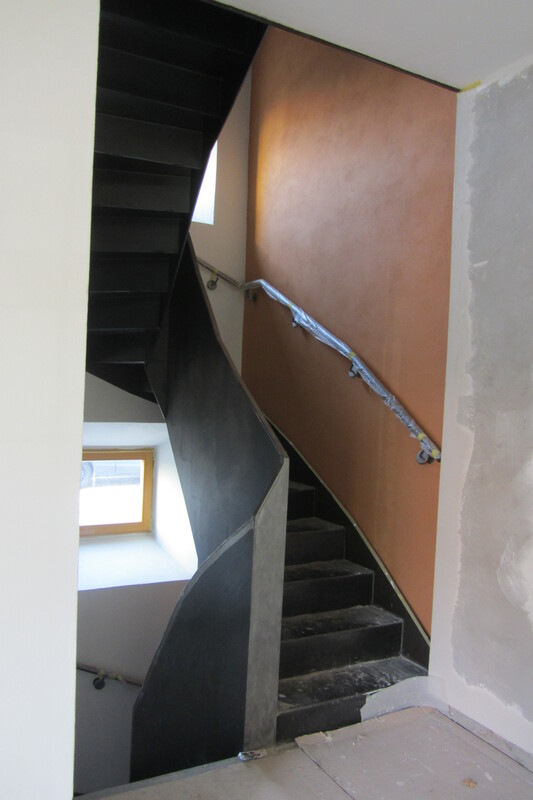 The solution we came up is to build the new staircase out of metal and paint one of the walls in Sienna. Five Phase-wise, the choice of the metal is meant to strengthen the 6 White Metal Mountain Star for health, but because we don’t want the Fire to tire out, we used a “red earth” colour to keep the fire burning but at the same time being neutralized with the introduction of earth in the colour, so the Gua Qi support for both wealth and health can co-exist in harmony. When we think about it, the choice we made using correlative thinking coincided closely with our desire to balance wealth with health in our life, it is as if the selection of material and colour, using the flying stars as inspirations, is a deliberate act, or a ritual of affirmation, of what we believed in. While balancing the stars we also thought about how to balance our life. Perhaps this aspect of Feng Shui is a self-activated ritual to sanctify our living and working environment, without having a religious overtone or being superstitious. Sienna on one side of the staircase looking from entry lobby. Our office/school viewed from the street. 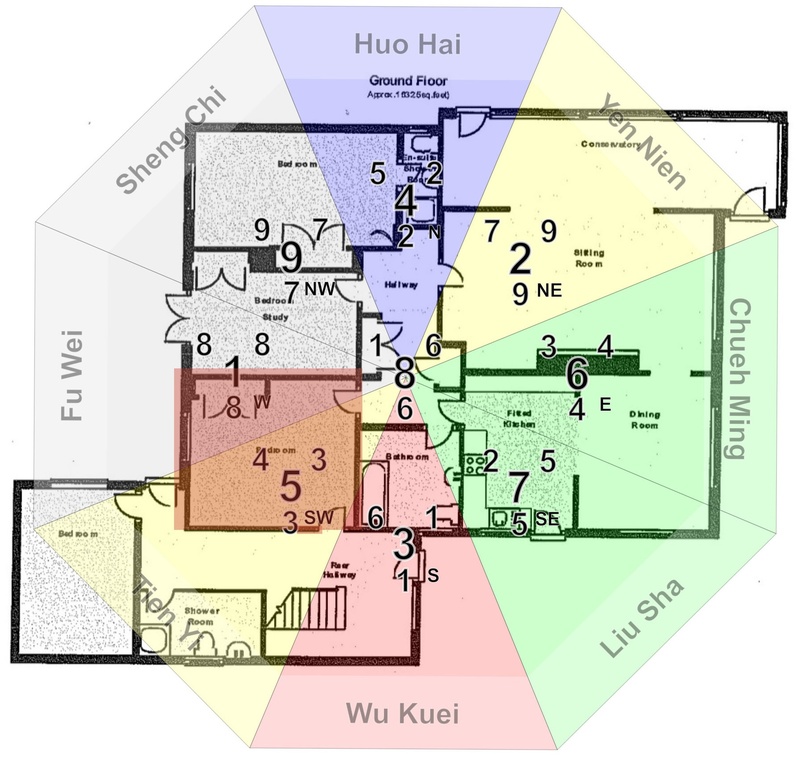 I taught an advanced Flying Star module for the Golden Gate School of Feng Shui earlier this year and one of the students (Wayne Wong) asked a couple of interesting questions and I would like to share the answers here because they are FAQ in Feixing. Here is the first one and I will post the answer to the second question (on the influence of the yearly star by Master Shen and by Master Luo) at a later date. Often in a star chart, a room is showed falling within two palaces, and then we have to look at their mutual influence. If we were concerned with wealth, then we would look at the relationship between the Facing (or Water) stars and if we were concerned with health then we would look at the Sitting (or Mountain) stars. Because we are looking at the mutual influence, there is no need to consider “host” and “guest” most of the time, only the Wuxing Sheng-Ke (mutual generating and controlling relationship of the Five Elements) and timeliness. Let us take the example below (a house built in Period 8 facing E2) and look at the room highlighted at SW, with influence from the West and SW. What we can find out is whether the room is suitable as a bedroom or as a home office; that is to look at the mutual influence of the Mountain Stars and then the Facing Stars. In the mutual influence of the two Mountain stars, it showed a combination of 8,4 that is a timely 8 White Earth star is is being controlled by a 4 Green Wood out of time (“dead”) which is in-effective, allowing the timely 8 to take full control and that is considered to be auspicious. However, when we look at the mutual influence of the two Facing stars, the combination of 8,3 is even better than 8,4 because we can see a Hetu pairing of Early Heaven Wood at the same time, indicating a potential growth in wealth, therefore a home office is more preferable but a bedroom is also suitable. But on top of this, when we consider the form of the room, a home office wins out because having two doors means it is an active room, less conducive for sleeping, resting and private use, especially when this room function like a corridor connecting the to parts of the house. It is important to note that we should not decide on what to do with a space just on the stars alone, we should also consider the physical context of the site and the human needs before an appropriate decision can be made. Tags: Flying Star, Golden gate School of Feng Shui., influence of adjoining palace in a star chart. 2014 is the year I would prefer as well and the following explanation is the way I would analyse the stars to come to my conclusion. For a yearly forecast using Flying Star there are in fact 3 layers (Pan or Plate) of numbers to consider. First there is the Luoshu Earth Plate, then there is the Period Heaven Plate and in between is the Yearly numbers, representing the human concerns we have for each new-year. Because yearly forecast is a form of divination, so the first thing we have to do is to ask the question what would we want the numbers (or the Stars) to tell us? 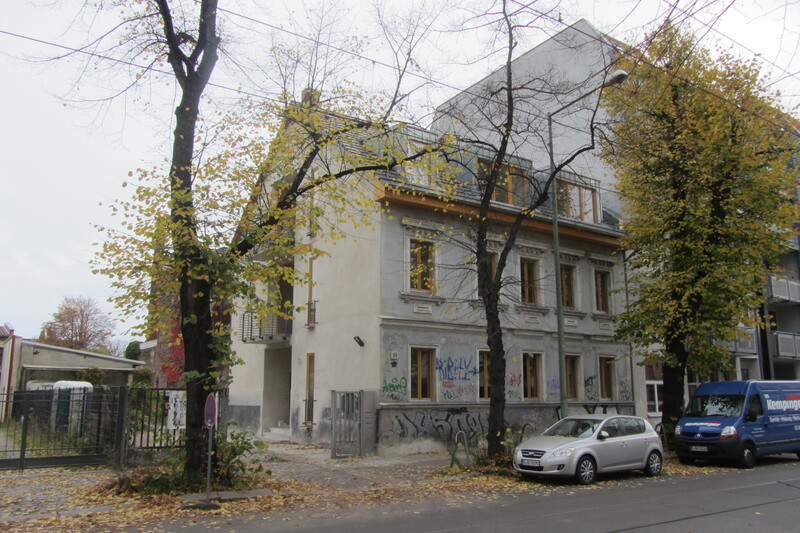 In this case, the task is to compare the 3 yearly charts for 2013, 2014 and 2015 to find out which is the most auspicious year to complete the project, located to the NE of Berlin Central. 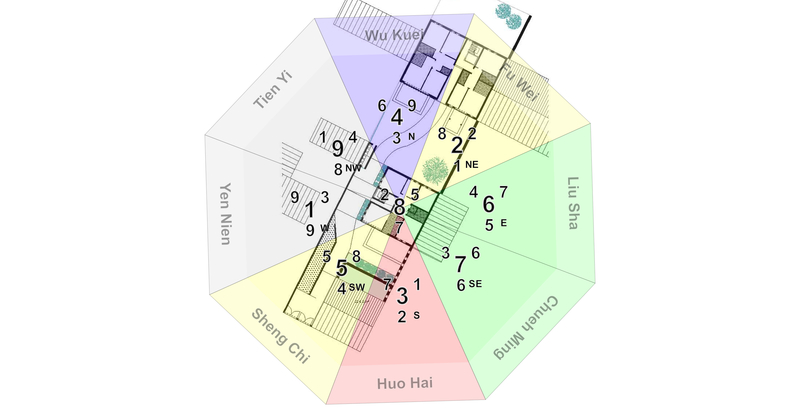 Since the project is located to the NE using Berlin as the central reference and we are concerned with a yearly forecast, the number in the NE palace of a yearly chart becomes the Host and we have to consider 3 other numbers to the Host, using Wuxing Sheng-Ke (the Five Elements relationship) and timeliness to assess the Ji-Xiong (Auspicious and Harmfulness) of each layer. Step 1) Compare the number in the NE palace of a yearly chart with the number in the central palace, this will give us an indication of the influence of Berlin as a city on the site in the a yearly basis, this comparison uses numbers in the same layer and is immediate but only lasts for one year. Step 2) Compare the number in the NE palace of the yearly chart with the number in the NE palace of the Period chart, this will give us an indication of how the period affects the year in the NE direction. These are both time stars as well and the comparison lasts longer, so this is the most influential. 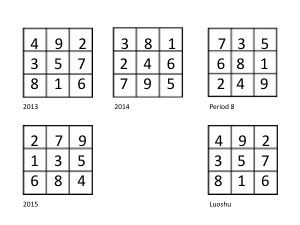 Step 3) Compare the number in the NE palace of the yearly chart with the number in the NE palace of the Luoshu chart, this will give us an indication of how the Earth Qi affects the year in the NE direction. This comparison has the weakest expression as the Luoshu layer is non-specific and we are comparing time with direction that are not in the same layer, so this layer is the least influential of the 3 layers. In 2013, the 8 White Earth is the Host when compared with the 5 Yellow Earth in the central palace, they are “of the same” (Step 1). When compared with the 2 Black Earth of the Period chart, it is again “of the same” (Step 2). On the surface it looks good but in fact, they are too much of the same, all Earth making the situation static and we can also see this is a case of “Fu Yin” (Repeated Chanting) of the yearly star chart with the Luoshu chart in Step 3, so it is best to give 2013 a miss. In 2014 and referring to Step 1, 7 Red Metal is the Host and 7,4 is “control out” of a Declining Star to a Dead Star, there is not much gain but no harm is done as well because “what I control is my wealth” as the saying goes, even though little is gained. We don’t mind this because the project is a community “group-built”, the idea is not to make a lot of money but get a good design built for the community of like-minded residents. Step 2, 7,2 is Hetu pairing, which will give Early Heaven Fire and Fire represents passion, the driving force behind our project. Step 3, 7,8 is ”generate-in” so the Luoshu Earth Qi also supports the project to be completed in 2014. 2015 is not as good as 2014 because there is no Hetu pairing of the yearly star with the Period star as in 2014, even though 6,8 with the Luoshu layer is better than 2014. When we bring the Stem and Branch of the year into consideration, 2014 Jia Wu is a harmonious Year as mentioned by Sintra, so 2014 is my final choice. Besides, from a construction programing point of view, 2014 is the more realistic year to complete the project, so there is a practical reason to chose 2014 as well. Thank you for your participations. Kung Hei Fatt Choi to all! We just started a new commercial/residential development project in Weisenseer Spitze, about 10 minutes drive to the North-East of Berlin’s Central Business District, where our new architectural office (ar-qi-tekture) and Feng Shui school (ECOFS) will be located in an existing building under conservation at the front of the property, and 12 new residential units to be built behind . We used Flying Star calculations in the design (see chart below with an auspicious “Prosperous Mountain and Prosperous Facing” pattern) and there is no financial pressure to finish the project with a fixed time frame, so the Flying Star quiz is, “Which of the 3 years, 2013, 2014 or 2015, is the best year to complete the project?” This year (2012) is too soon for a project of this size. In 2013, 5 flies into the middle palace and 8 ends up in the NE; in 2014, 4 flies into the middle palace and 7 ends up in the NE and in 2015, 3 flies into the middle palace and 6 ends up in the NE. 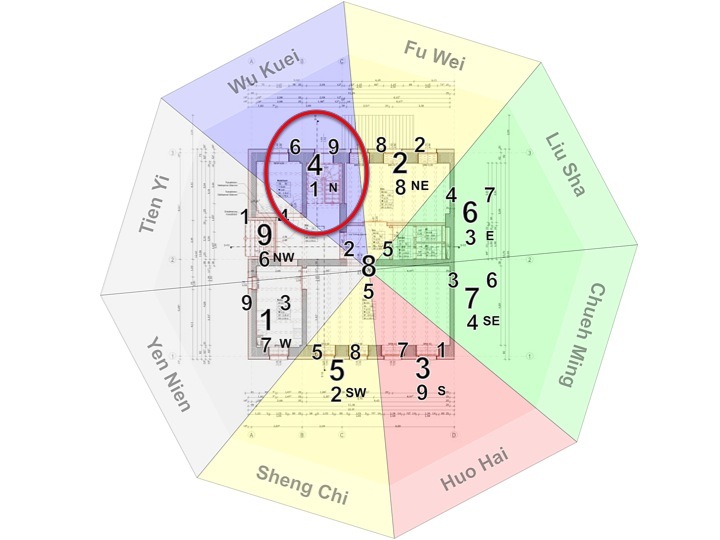 The yearly star in the NE palace represents the project and how it is related to the number in the central palace, to the Luoshu number and to the Period 8 number in the NE, will give us an indication of the influence of the Human Qi, Earth Qi and Heaven Qi of time respectively on the project. If you are interested in the quiz, please send in your answer and reasoning (click “Leave a Comment”) before the Chinese New Year of the Dragon (23 January 2012), I will give my answer and reasoning afterward. It is a good way to practice your “prediction” skill to help with building scheduling on the first day of a new-year. Tags: Feng Shui quiz, Flying Star, yearly predictions.